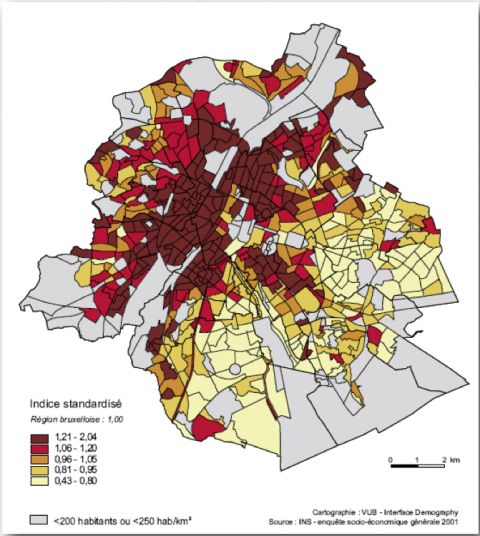 Can the major health inequalities between Brussels districts be reduced? How can the environment’s negative impacts on health be limited? How can all children be given conditions of childhood that are conducive to good health? What policy is needed for the elderly in Brussels? 1The proportion of the Brussels-Capital Region’s population that does not consider itself to be in good health is higher than the national mean. The percentages for the various regions are 29.7% in Wallonia, 27.6% in the Brussels Region, and 22.2% in Flanders. 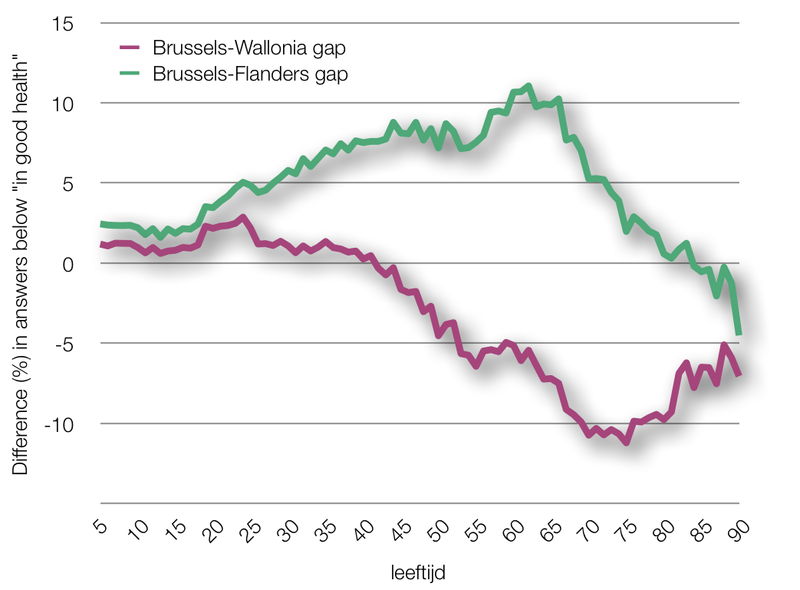 2If we take account of the population’s age structure, the situations in Wallonia and Brussels are even worse than the raw figures show. Despite the Brussels population’s youth, the potential demand for health care, measured by means of perceived health, is 26% higher than that seen for Flanders and 8% below that seen for Wallonia. The differences between regions can be interpreted as a health deficit compared with the region exhibiting the better profile. 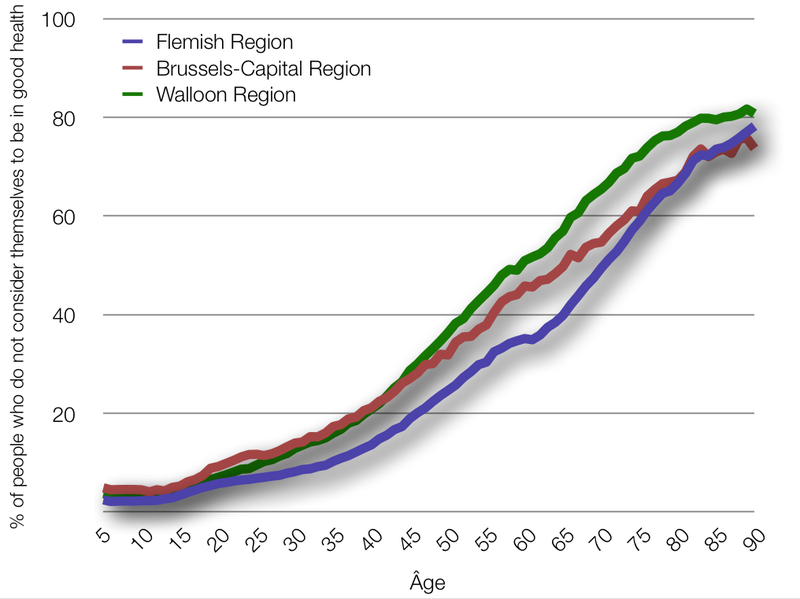 The Brussels Region has a health deficit compared with Flanders for all age groups below 84 (Figure 1). For each age group between the ages of 24 and 72 the proportion of Brussels residents who do not consider themselves to be in good health is at least 5% higher than in the same-aged residents of Flanders. 3When it comes to residents under 40 years of age, the situation in Brussels is the least favourable. This reflects the population’s composition, i.e., strong over-representation of immigrants with a low socio-economic status among young people and a more affluent elderly Belgian population concentrated in Brussels’s richer municipalities. In future we can expect heightened pressure on the city’s health services as the younger generations in less good health age. 4Suicide is the main cause of potential years of life lost in Brussels’s male population, followed by lung cancer and ischaemic heart disease. In the case of the female population, breast cancer is well in the lead, followed by suicide and lung cancer. This “Top 3” shows the major roles of mental suffering, smoking, diet, stress, sedentary lifestyle, and, in the case of women, factors linked to reproduction (e.g., the increasing rise in the age at first childbirth), in premature deaths. All of these factors are largely dependent on the social environment in the broad sense. 5As for all industrialised countries, the main determinants of health in the Brussels population are social status, lifestyle, and the environment in the broad sense. These determinants are strongly linked to each other. 6Social status is the most powerful determinant of health. The great social heterogeneity that characterises the Brussels-Capital Region is thus reflected in sizeable socially determined inequalities in health status. These inequalities are visible from birth and concern both physical and mental health. We also see a very clear social gradient when it comes to health problems that are “on a roll”, such as obesity, which affects 31% of the region’s young women with little schooling compared with 5% of the women with higher education qualification. This is a true challenge, given the many medical complications (diabetes, heart disease, and cancers) and psychological complications that are associated with obesity. 7Lifestyles, such as diet, level of physical activity, smoking, and drinking, have major impacts on the health of Brussels’s residents. These lifestyles do not result solely from “free” individual choices, but are greatly influenced by living conditions, environment, economic, mental, and social resources, and level of education. This is what explains the social inequalities that are reflected in such behaviours. The proportion of heavy smokers fell between 1997 and 2004 in Brussels residents with at least a high school education whilst it rose in the segments with lower academic credentials. 1 The official statistics give the breakdowns by nationality, not by ethnic community. 8Cultural aspects also influence these lifestyles. For example, mortality for diseases linked to heavy drinking (the sixth leading cause of death in men over 65) varies greatly by nationality. After standardising for age, it is 6.3 times lower for male residents of Brussels who are Moroccan or Turkish nationals than for Belgian nationals1. The non-Belgians also have markedly lower mortality rates for other causes of death linked to lifestyle, such as breast cancer, lung cancer, suicide, and so on. The presence of immigrant communities that bring often healthier dietary habits with them as well often explains the more favourable situations in Brussels for certain indicators such as breast feeding and fruit and fish consumption. The urban environment is also more conducive to adopting less favourable lifestyles such as eating prepared dishes and fast food. 9The general environment also influences health. The influences are negative when it comes to noise, humidity, pollution, fear of crime, and so on, and positive when it comes to providing places for relaxation, socialising, etc. The quality of housing also plays a major role, but so does the increase in automobile traffic in the city, which generates major noise pollution, deteriorates air quality, is a source of danger for pedestrians, cyclists, and other more vulnerable users of city streets, and is swallowing up more and more of the city’s public space. 10The spatial distribution of healthy environmental factors corresponds more or less to the spatial distribution of the more affluent districts, whereas the spatial distribution of unhealthy environmental factors corresponds to the spatial distribution of the city’s disadvantaged districts. 11A person’s state of health is determined by an accumulation of positive and negative factors in the course of her/his life, starting with in utero life. Most of the risk factors for health have long-term impacts and living conditions in childhood and adolescence strongly influence one’s state of health in adulthood. However, each period of life also has specific needs and the factors that are conducive to and define quality of life and satisfactory health change with age. The question of health is especially sensitive at either end of life and will be taken up below. 12The uneven distribution of health across Brussels’ districts (see Map 1) raises the question of the influence of the place of residence on health. 13Composition effects seem to play the main role in explaining the differences between districts in the Brussels Region. Indeed, if one controls for socio-economic factors, practically all the health differences between districts disappear. 14There may be a selective effect linked to health, but the health differences between districts are explained above all by an overall social segregation effect. The health inequalities between population subcategories are the consequences of social factors that generate poor health. If such inequalities exist between districts, it is because these same social factors determine people’s access to the housing market. The level of instruction, occupational career, and income give access to the better or poorer segments of the housing market and, ipso factor, to the better or poorer districts. That is why, despite intense population movements, the spatial inertial of the health inequalities in the Brussels Region is very high. The incoming and outgoing population movements do not change the districts’ social compositions. The new residents move into the city and its various districts selectively, in line with their financial means. 15However, this does not rule out the possibility that the immediate environment can in turn influence health, be it positively or negatively. 16Any given factor’s impact on health is increased by combined exposure. In the disadvantaged districts around the city centre, exposure to noise is great because several sources of noise (traffic, neighbours, etc.) come together in such areas and the buildings are poorly insulated. Indoors, the air is particularly polluted through the combined effects of several sources (inappropriate heating systems, humidity, poor materials, passive smoking, and so on) and the impact of this indoor pollution is strengthened by more crowded living conditions and ventilation problems. Living space is limited both inside the dwellings and outdoors, where green areas are particularly rare. 17The environment’s impacts on health are also augmented by length of exposure. The frequent removals within the Brussels Region take place between similar districts and housing types. Consequently, even though some people remain in a given residential environment a relatively short length of time, in the course of their lives they accumulate exposure to the same types of negative health factors. This general environment helps to raise the already higher levels of stress that characterise the socially underprivileged populations that reside there. 18The situation of children in Brussels is singular, for children account for a larger proportion of the population than in the rest of the country and are marked by particularly worrisome inequalities when it comes to health. 19Before delving into these elements, we must recall that the available health data on children are deficient. Child health assessments must take account of not only motor and physical development, but behavioural, social, emotional, cognitive, and linguistic aspects as well. However, the routine indicators that are available are basically limited to those of physical health. For example, infant mortality is three times higher in Saint-Josse / Sint-Joost (6.3 per 1 000 births) than Woluwé-Saint-Lambert / Sint-Lambrechts-Woluwe (2.1 per 1 000 births). 20On the other hand, people approach children above all as “future adults”, since their health is one of the determinants of the future adult population’s health. Yet children cannot be reduced to plans for the future. They have rights, too. 21“Subjective health” is thus the only indicator available to tackle the health and welfare of children in the “here and now”, despite some limits when this concept is applied to children. For this indicator, too, geographic inequalities exist for children between the ages of 6 and 12, with a higher risk of reported poor health in children (often reported by a relative) in Saint-Gilles / Sint-Gillis, Saint-Josse / Sint-Joost, and Molenbeek. 22The determinants of health are worrying: the favourable “childhood conditions”, that is to say the individual and collective conditions in which children live out their childhoods and develop in good health, are highly unevenly distributed. Overall, one third of the children live with a single parent, mainly the mother, and 17% of births are registered to women without companions. Single mothers, who are particularly numerous in Brussels, are twice as likely to report being in poor health between the ages of 20 and 40 than women belonging to other types of household. This is not without incidence on their children’s health. 23Twenty-eight percent of births in Brussels are in families without income from work. The largest numbers of children are found where the population is the most dense and the poorest, where housing is most cramped and has the fewest amenities, where private and public gardens are the least numerous. 24The child population is growing and birth and fertility rates are well above those of the other two regions. The Brussels-Capital Region also concentrates the largest number of first-generation immigrant children, both legal and illegal. This growth affects services in the region. So, between 1996/97 and 2006/07, enrolment rose 20% (up by 6 500 children) in the French-speaking nursery schools and 26% (up by 2 270 children) in the Flemish nursery schools. The large number of spots recently created in day-care facilities merely enables the system to maintain the former rate of coverage. 25Preschool day care (“crèches”), schools, and afterschool day care are important for children’s lives and their families. In Brussels, however, they depend on various decision-making levels and the municipal investment rates vary. For crèches, the range of coverage varies from 1 to 5 in the various boroughs. Part of the demand is not met. For children over three in Brussels, getting into nursery school is starting to require early registration strategies, with parents registering their progeny one to two years ahead of time. No studies of this new phenomenon and its consequences have been conducted as yet, but ordinarily the consequences of such behaviour are rarely advantageous for families with low levels of education. 26We are stressing the venues of education because they are recognised as having multiple significance today: They create favourable material living conditions during the day and provide support to families where the parents and children are familiar with other educational practices, where the parents are creating new reference points, and where those who live in precarious socio-economic situations find opportunities to become more firmly anchored in society. New forms of service are cropping up in the fields in line with these different perspectives, whether for short spells of care, part-time care, or for the long haul. These services are recognised as part of social policy or district rehabilitation schemes. 27The Brussels Region has a younger age structure than the other two regions: The proportion of the population under 60 is smaller than in the rest of the country and should remain stable for the next fifteen years. In contrast, it has proportionately more very elderly people (≥85 years of age) with greater assistance and care needs. In future, the “ageing of the aged” should increase. In 2050, the number of elderly people over 80 will account for 40% of the over-60s, compared with 27% today. Still, their needs will not rise at the same rate for life expectancy without invalidity will also increase. 28Today, Brussels residents who are over 65 are in a more favourable situation than the Belgian mean when it comes to instruction, socio-economic status, and state of health. The situation should ultimately turn around; however, for the Brussels residents in the 50‑65-year-old age bracket today are in a less favourable situation than the national mean for these indicators. The proportion of people of immigrant descent in the higher age brackets will increase greatly in the next fifteen years. 29The three community commissions have made keeping elderly people at home as long as possible, in order to improve the quality of their lives and to keep expenditures down, as one of their political priorities. 30In urban areas, factors such as living alone, weaker social cohesion, the type of housing (multi-storey houses, often without lifts), and a precarious socio-economic situation tend to increase institutionalisation. In contrast, the large percentage of immigrants in the population bolsters the trend of keeping elderly people at home, but this could gradually change. 31The overwhelming majority of Brussels’s elderly citizens live at home. However, the proportion of the elderly in institutions is above the national mean. The figures are 6.3% (compared with the national average of 4.9%) for the over 60 and 22.6% (vs 22.4%) for the over 80. At the same time, mean spending linked to home care is 2.7 times higher in Flanders and 2.1 times higher in Wallonia than in Brussels. 32Various investigations carried out in Brussels have shown that the risk of institutionalisation is low in people who have an active attitude to “growing old”. Such people continue engaging in social, cultural, and physical activities as long as possible, plan for their ageing well in advance, and adapt their behaviour and environment in line with such foresight. They build a network of informal but also professional home care around themselves, which makes it possible to avoid or delay institutionalisation considerably. Such an attitude is possible, however, only in a favourable environment and if the offer of care and services can meet the needs of the elderly in their homes (relational, social, medical, nursing, psychological, and other needs). The inventory of services offered in the Brussels Region has revealed some gaps: basically a lack of nurses, home helpers, psychological counselling and care, support for informal helpers, day-care centres, night facilities, short-stay centres, and so on. Very often the assistance and care that are orchestrated from the home are layered on without any real coordination and prior assessment of the diversity of the elderly person’s needs. 33The culture of caring for the elderly is still too focused on medical care, with too little focus on the elderly person her/himself. 34Reducing the socially predicated inequalities in health in the Brussels Region is a priority to improve the health and quality of life of the population. Following the lead of other regions and countries, the Brussels Region (both civil society and the political authorities) could devise a true plan of action to narrow the health divides. 35A coordinated set of multiple horizontal strategies is the only way to get results. These strategies must include measures to reduce the developmental inequalities between young children and educational inequalities between schoolchildren; measures that improve the security of existence and access to employment and sufficient social protection for the most vulnerable; measures that ensure quality health care for everyone. 36Reducing the social inequalities in health doubtless also entails improving the city’s social mixity so as to allow a more equitable redistribution of the region’s resources, including its green areas. 37Physical and mental health can be preserved or improved by measures that enable everyone, including those with very low incomes, to sufficient healthy living space that guarantees their safety, good indoor air quality, tranquillity, and the possibility of establishing good-quality relationships with their neighbours. 38Public areas must also be planned and redone with health objectives in mind, for example, promoting physical activity, limiting isolation, and fostering conviviality. 39The region’s environmental policies must take account of cumulative exposure to pollution and annoyance in the most disadvantaged districts, for example the problem of noise pollution. 40The data that are available on children should suffice to mobilise priority investments under a concerted policy for early childhood. 41Economic, social, educational, and cultural structural policies are a must to improve the socio-economic statuses of all families, but they are not enough to reduce the social inequalities of health in childhood. They must be complemented by schemes to give more attention and resources to the more precarious districts where large numbers of children live so that they can enjoy conditions of childhood that are favourable for their health, cultural education, and education and their needs to meet others, to interact, and to play. 42The current “crèche plan” (Plan crèches / Kinderkribbenplan) seems to be working as planned to stimulate more equity in the regional preschool day-care policy, since it considers the poorest boroughs, where birth rates are highest, to be priority areas. Still, the layer cake of policy segments specific to various social issues, such as working mothers, poverty, single-parent families, free time, maltreatment and at-risk children, etc., has shown its weaknesses in Brussels, giving a look at the results. Families are above all in search of comprehensive resources and services that are not oriented by “problems” but rather that are designed to support their skills, potential, and abilities. 43This could be achieved by recognising the unconditional right of all young children to a place with quality care in nursery schools and day care facilities. These services would enable the children’s parents to work and get education, which is a structural prerequisite for improving families’ living conditions and thus children’s lives, but also to reinforce the mother’s social status and enable single mothers to escape poverty. However, it is just as necessary to recognise reasons other than economic ones, namely to shatter isolation, build guidelines, offer educational opportunities to children, and get child rearing in Brussels to become a collective responsibility. 44Appreciating the place and active role of the elderly in society is vital. Their participation in community life is useful to society as a whole but also enables them to remain dynamic and independent as long as possible. The elderly person must remain in control of her or his life. 45Developing preventive strategies in the home and community to get a jump on, delay, and provide assistance for the limitations that accompany ageing is also vital. This means encouraging the participation of the elderly in association, cultural, and social activities (through financial accessibility, mobility measures, activities in the home, etc.). The neighbourhoods and housing must be designed or renovated to enable them to live at home as long as possible (means of transport, neighbourhood shops, safe sidewalks, increased supply of housing for low-income elderly people, service residences, and so on). 46It is important to increase early assessment of geriatric fragility by training GPs and informing the public at large so as to facilitate the gradual implementation of solutions. 47Our senior citizens will be able to continue living at home only if home care services can meet the needs that are linked to ageing-related disabilities. The supply of such services is currently insufficient. Information about the types of assistance that are possible should be centralised better and disseminated to the various parties concerned. The coordination of services and assistance for the elderly must be made more efficient. Major economic savings and improvements in the quality of elderly people’s lives could be achieved by efficient coordination in close cooperation with the elderly and their close relatives and helpers to develop, very concretely, a plan of care, services, and assistance and appoint a person or entity to oversee its implementation. CERE (2007) Les conditions d’enfance en Région de Bruxelles-Capitale. Indicateurs relatifs à la petite enfance et aux familles. www.cere-asbl.be (consulted on: 10 January 2009). DE SPIEGELAERE, M. (2007) “Inégalités sociales, logement et santé”, In CORNUT P., BAULER T., ZACCAÏ (eds) Environnement et inégalités sociales, Editions de l’Université de Bruxelles. DUSART, A.-F. (2007) Accueil atypique en Communauté française. A la recherche des conditions optimales d’accueil, vers une politique d’accès égal pour tous. www.cere-asbl.be (consulted on: 10 January 2009). Observatoire de l’enfant (2006) “L’accueil de l’enfant à Bruxelles. Grandir à Bruxelles”, Cahiers de l’Observatoire de l’enfant, No. 17‑18. www.grandirabruxelles.be (consulted on: 10 January 2009). Myriam De Spiegelaere, doctor, with a PhD in public health, is Scientific Director of the Brussels Health and Social Observatory and a lecturer at Université Libre de Bruxelles (ULB) - School of Medicine. Her work concerns amongst other things monitoring the health of Brussels’s residents, the social determinants of health, and public health decision-making assistance. Her publications include a report on perinatal health indicators in Brussels, Les indicateurs de santé périnatale en Région de Bruxelles-Capitale 1998‑2004, Observatoire de la santé et du social, 2006. Marie-Christine Closon is professor of health economics at Université catholique de Louvain (UCL). In charge of the Health Socio-economics Centre of the research institute on health and society Institut de recherche santé et société. Patrick Deboosere, master’s in political science and PhD in sociology, is linked to the Interface Demography research group of Vrije Universiteit Brussel (VUB). His research focuses on household composition trends and health demographics. He has contributed to various publications concerning the Brussels-Capital Region’s population. P. Deboosere, S. Demarest, V. Lorant, P.-J. Miermans, M.-I. Farfan-Portet, H. Van Oyen (2006), Santé et soins de proximité, Enquête socio-économique 2001, Monograph 1. Perrine Humblet, sociologist with a PhD in public health, is a lecturer and head of the “Health Policies and Systems” Department of ULB - School of Public Health. She is cofounder of the non-profit centre of expertise and resources on childhood Centre d’Expertise et de Ressources pour l’Enfance (CERE) and works mainly on the social determinants of health and policies regarding children. She is co-editor of Recomposer sa vie ailleurs. Recherche-action auprès de familles primo-arrivantes, L’Harmattan, 2006.